Why Do Soldiers Break Step On A Bridge? Our son Nikhil and I had a discussion about the phenomenon of resonance about which he had a class that day. My mind wandered back to Mr PT Cherian’s high school physics classes. Mr Cherian had a knack of explaining basic principles of physics by citing real life examples which were simple and easy to assimilate. For more about Mr Cherian, please refer my blog https://rejinces.net/2014/07/15/guru-dakshina/. Mr Cherian explained resonance by using a simple experiment. He had three pendulums of different lengths and two of the same length tied to a rubber hose. He swung one of the two pendulums of equal lengths and after a few minutes, all the other pendulums begun to swing with the other pendulum of equal length swinging as much as the other. This he explained was as a result of resonance and the frequency of the two pendulums with equal lengths were same and hence they resonated. Bridges and buildings have a natural frequency of vibration within them. A force applied to an object at the same frequency as the object’s natural frequency will amplify the vibration of the object due to mechanical resonance. Mr Cherian explained that while on a swing, one can go higher with a jerk of a bend knee or a swing of the legs and a car wobbles at a particular speed; are all examples mechanical resonance. The shattering of glass by singers with their voice is also by the same principle. Mr Cherian then narrated an incidence which took place in 1831 when a brigade of soldiers marched in step across England’s Broughton Suspension Bridge. The marching steps of the soldiers happened to resonate with the natural frequency and the bridge broke apart, throwing dozens of men into the water. After this, the British Army issued orders that soldiers while crossing a suspension bridge must ‘break step’ and not march in unison. If soldiers march in unison across the suspension bridge, they apply a force at the frequency of their step. If their frequency is closely matched to the bridge’s frequency, the soldiers’ rhythmic marching will amplify the natural frequency of the bridge. If the mechanical resonance is strong enough, the bridge can vibrate until it collapses due to the movement. A similar tragedy was averted in June 2000 when a large crowd assembled at the opening of London’s Millennium Bridge. As crowds packed the bridge, their footfalls made the bridge vibrate slightly. Many in the crowd fell spontaneously into step with the bridge’s vibrations, inadvertently amplifying them. The police swung into action to clear the crowd off the bridge. Though engineers insist the Millennium Bridge was never in danger of collapse, the bridge was closed for about a year while construction crews installed energy-dissipating dampers to minimize the vibration caused by pedestrians. Another example of mechanical resonance was the destruction of Tacoma Narrows Bridge in Washington in 1940. Even though the bridge was designed to withstand winds of up to 200 kmph, on that fateful day the wind speed recorded was mere 60 kmph. A mechanical resonance resulted due to the wind at that particular speed hitting the bridge perpendicularly. Continued winds increased the vibrations until the waves grew so large and violent that they broke the bridge apart. In May 1999, two girls were drowned and 15 others injured when a suspension bridge across a river collapsed in Panathur, Kasargod in Kerala state of India. The incident occurred when a group of people taking part in a funeral procession entered the suspension bridge The bridge tilted and collapsed, again due to mechanical resonance. In a similar incident in February 2014, eight people died and more than 30 injured when a suspension bridge collapsed over a dry stream in the North-Western province of Lai Chau in Vietnam. The accident happened as a group of local residents walked across the bridge to bring the coffin of a local official to a graveyard. 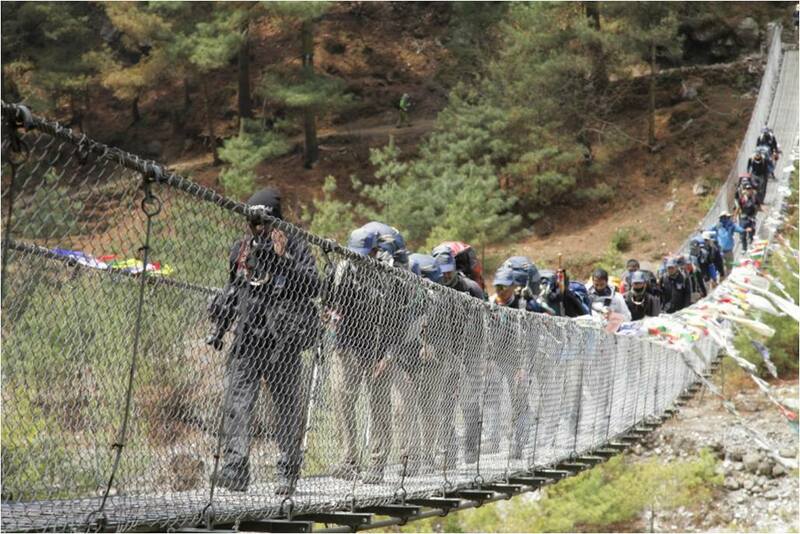 The group had walked 15 meters on the bridge when it suddenly collapsed. What would have triggered off the mechanical resonance in the above two cases? The villagers participating in the two funerals were surely never drilled down by any Sergeant Majors. It is felt that anyone while on a funeral procession walks slowly and is often accompanied by the drums or hymns being sung at a melancholic pace. The funeral participants tend to bunch together, mainly due to their sadness. These factors could have forced the funeral participants to march in step, without their knowledge. Another reason of marching in step could be that one does not want to step on another’s foot and the best way to avoid is to walk in step with the person in the front. In both the cases, the coffin would have been carried by the coffin bearers with their hands. This would need the coffin bearers to walk in unison. In all probability, the frequency of walking of the mourners in the funeral procession would have resonated with the natural frequency of the bridge, causing the bridge to swing violently. The pandemonium that would have set out must have caused panic, resulting in the mourners rushing to get off the bridge causing a stampede. Hence in future the rule must be that not only the soldiers need to break steps on a suspension bridge, but also a funeral procession. Hi Reji, a helicopter can shatter due to ground resonance. Hence the pilot has to be extremely careful during pickup and sit down. I have experienced a very minor one and it is a very scary feeling. If you stand at one place it is Kinetic energy, if you it is potential energy. .good piece Reji. I was inspired by Mr. Cherian to take up Physics as my major at University and spent half my professional career teaching Physics. That’s the influence of good teachers.